Take a Golfing Break with NuvoDesk! How would you like to take a break and play some golf while improving your golf game? According to the University of Maryland, moderate exercise, such as playing a round of golf, may protect people against future anxiety and stress. The study found that golf can not only reduce anxiety but can help you maintain that reduced anxiety after the round of golf is finished. Would you like to play Augusta National or Pebble Beach Golf Course without having to fly to those locations? 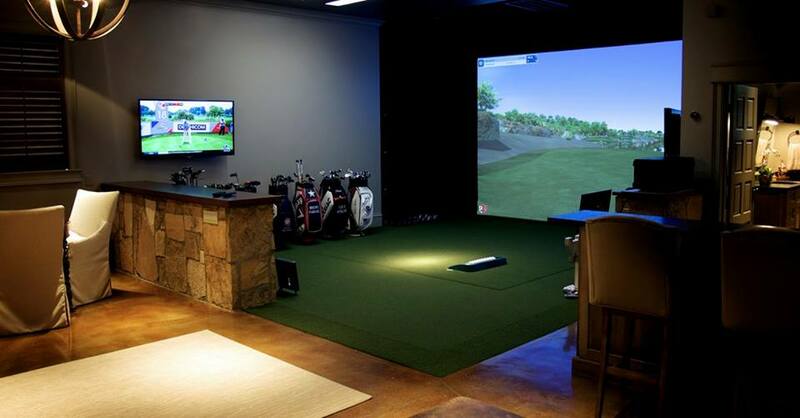 Ready to play the back nine through our patented golf simulator? Join us for some relaxation, stress relief, and the opportunity to bring prospective clients to NuvoDesk for a quick game of golf. Best part is that you can rent our golf simulator by the hour. Bad weather will never be a problem at our indoor facility. Executives, business owners, golf professionals, and aspiring golfers can all play at our state-of-the-art TrackMan golf simulator. The TrackMan golf simulator gives you both the opportunity to have a great time playing golf and to improve your swing through the performance software. You can enjoy playing our golf simulator and take advantage of an immersive, engaging, and fun golfing experience, all while in the comfort of our NuvoDesk co-working space. Whether you are wanting to take a break to play a round of golf or want to bring a prospective client for a quick game, this is a unique opportunity in an environment that will never have weather issues including rain or excessive heat. You can play anytime you want year-round for only $40.00 per hour for Nuvo-Desk members and $60.00 per hour for Non-Members. Join us at NuvoDesk for your next round of golf.